The Kids Made Me Fat: Saving Grace. 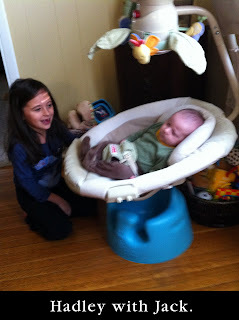 Hadley stopped today to play with Jack in his swing. 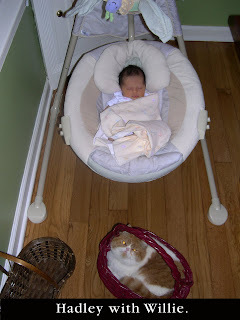 Hadley, as a baby, used to sleep for hours and hours in this swing, her only companion being our cat, Willie. Now, she is a big sister who is delighted by her little brother. She coos at him, and he coos back. These are the little moments that make me and all mothers pause in the midst of their overwhelming lives to be filled with so much gratitude and love it's nearly too much to take. It completely fills you up. Of course, these moments are brief - they don't last. However, they're enough to keep you going through one more tantrum or one more wretched trip to the grocery store. These moments are our childrens saving grace because without them, I'm afraid mommy would spend her days hiding in the closet with a bar of chocolate.